yeah, your right, it's pretty fresh... but Harvey had the whole thing purple. You mean like Sabine is now with millions of gallons more in the way from Toledo Bend. I'm surprised any trout are in the lake. Edit: Thank you for sharing, never knew this forecast existed! 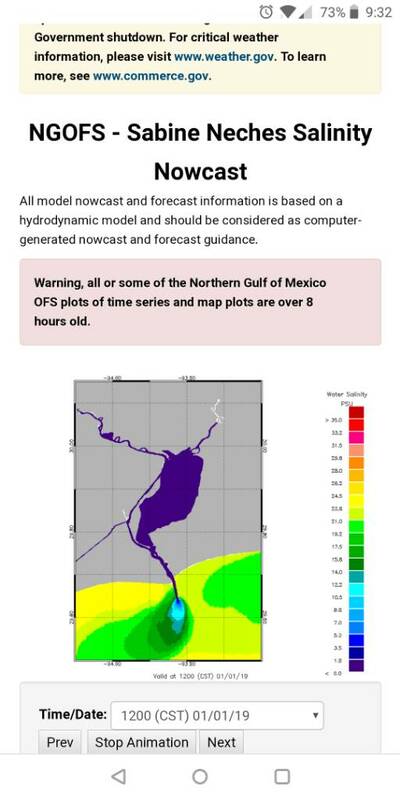 I am assuming the model is semi accurate for Galveston Bay. Probably even a little fresher. But it is a joke and has been for Chocolate Bay. Chocolate is just as fresh as most of the lower end of Galveston Bay but it has it at over 17 all the way up to the Bridge on 2004. Thats not even ballpark. everything is wet and it's just running off. but that said, except for Sabine Lake, there are fish to be caught in Galveston th west and east bay (and west of there). they opened the gates to 3' at Toledo overnight, from 1' the day before, we are saturated beyond belief here in sabine town. No, the model is not accurate. They didn't include the effects of bottom topo of the bay (that's called bathymetry), the dike, and yes, they don't show correct flows for choc either. And, from what I can tell, it's only a surface salinity focus, there is no calculation for what the salinity is on the bottom where fish will tend to hold during surface freshness. In upper Trinity its likely fresh from top to bottom but that isn't true of other parts of the bay. All 12 gates at the Livingston dam have been flowing over 20K cubic feet a second for about 90 days or more. Where the heck ever those big schools of freshwater fish that got flushed down from the lake are should be interesting. Big gator gar eat most of that tonnage of fish getting blown downriver I would bet. This is the new normal seasonal pattern. A flooding rain falling off and on from November to March. Making the Trinity River stay at flood stage for a 1/3 of the year. The gates at Livingston open up 30’ underwater, for every foot open a 1,000 cfs flows through. It’s at about 50K now and has a dangerous flow. It’s time to adapt to the new normal because for the last five out of seven years that’s how it goes. Last edited by shadslinger; 01-04-2019 at 05:33 AM.